One of my favorite things about going to my in-laws house in the Chicago suburbs is the food. Man, oh man, is Chicago food amazing. My usual M.O. is to pick up lunch for my wife and Mother-in-Law at Portillo’s. Most people would just do the obvious and order and Italian beef from Portillo’s, but not me. There is better Italian beef in Chicago. Much better. So, I get what they want then head down 95th Street to Al’s Beef. After waiting in the ridiculous line for a couple of salads and some chicken tenders from Portillo’s, I went to pick up my Italian beef. My heart sank when I pulled in the parking lot. It was closed. Again. There was some ridiculous sign on the door about being closed for maintenance and they would be reopening “soon.” This is the second time that has happened. I wasn’t going to go back to Portillo’s and wait in line again, so I brought the ladies’ food home then had to head back out to find an Italian beef. There are many, many places in Chicago that will sell me one,but finding a good one just isn’t that easy. I passed a few places then just decided to head south on Cicero to Crestwood. There was a place we had passed many times that I wanted to try and now was as good of a time as any. 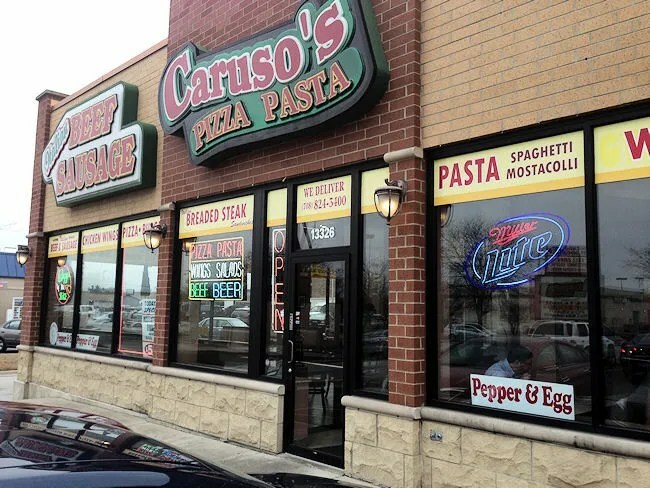 Caruso’s Pizza & Pasta is just off the very busy Cicero Avenue on Rivercrest Drive. It’s not hard to spot once you turn off of Cicero. The building is covered in bright signage which makes it easy to spot. I walked in to find the familiar busy menu board hanging above the order counter. I knew what I wanted so I barely looked at it. I kjnew they had my Italian beef, so I ordered that with hot peppers. I also ordered a fry and the clerk asked if I wanted to make it the meal deal which gave me a small fountain Coke. I did even though the pop was laughingly small and it was Coke. I actually think I saved myself a few cents so no biggie. The was right around $10. I took a seat in the small dining room to wait and sipped my Coke. It took about five minutes for a brown paper bag to be brought up to the counter with my food. I started in on the fries as soon as I got back to my in-laws. 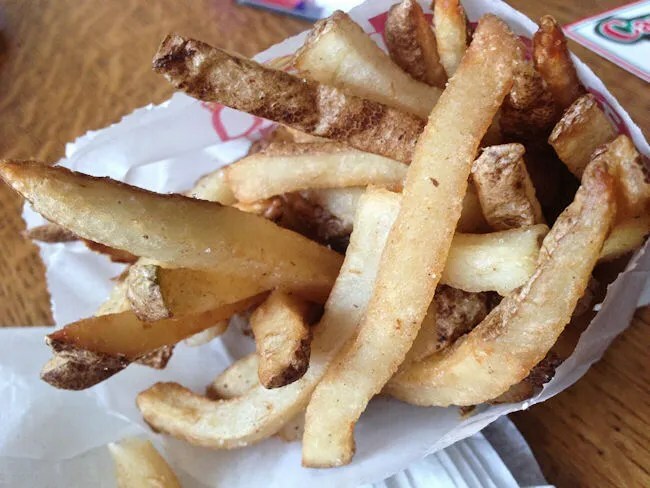 They were delicious fresh cut, greasy fries with just a little bit of salt. There were so many of them that I was afraid I was going to fill up on potatoes before even unwrapping my beef, so I stopped for a few minutes to see what was in the white butcher’s paper holding my sandwich. The Italian beef was almost what I was looking for. The crusty french roll contained a very tender, flavorful beef and a hot, vinegary mess of hot peppers. The downside is that the sandwich was pretty dry. 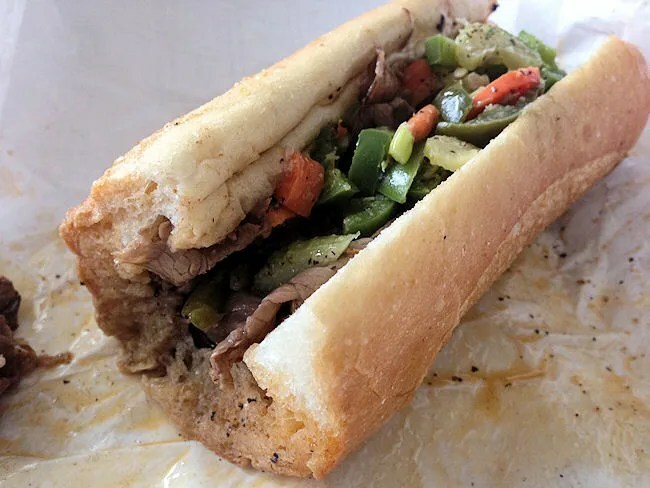 I like my Italian beef’s dipped in the gravy that the meat is soaked in. The best Italian beef is one where they bun is disintegrating in your hand. I had asked for it dipped, but it wasn’t. I still had a pretty good sandwich, but one that could have been so much better. Caruso’s turned out a pretty good Italian beef sandwich, but no place is going to replace Al’s. The city and suburbs are filled with these hot dog joints andn it’s hard to stand out. 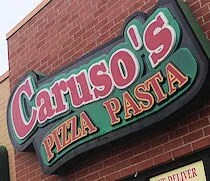 I really think I would have liked Caruso’s if the sandwich had been dipped. Since it wasn’t, it turns out to be just another sandwich joint on Chicago’s south side.